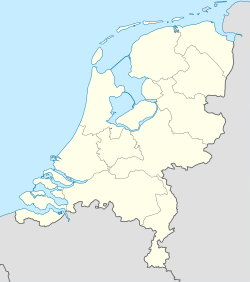 Drachten (Dutch pronunciation: [ˈdrɑxtən]) is a town in the municipality of Smallingerland in the Netherlands. It had a population of around 45,186 in January 2017 and is the second largest town in the province of Friesland. Drachten began as a small community on the east side of the Drait River. There, early settlers started draining the land to use it for agriculture. As the process of draining progressed, residents began to move further eastward in order to use the drained land—former peatbogs—for agriculture. Around 1200 A.D., a small stone church was built. It was used for 200 years afterward, until rising waters drove people even further east. By 1550 the Dutch peat reserve had been exhausted. Peat had become an important source of energy, not only for private households but also for the industry. The need in the rapidly growing province of Holland during the 17th century was higher than Friesland could supply. Most of the transport was over water, therefore often by track boat. Peat exploitation meant a welcome activity for many villages, although most of the income did not flow into the pockets of the struggling peat cutters. In 1641 A.D. farmers in Drachten North and Drachten South entered into an agreement with wealthy residents of The Hague, the 'Drachten Associates'. One of these moneylenders was businessman Passchier Hendriks Bolleman from The Hague.The agreement stipulated that peat cut in Smallingerland was designated for the Holland industry. For transport by boat the Drachtster Compagnonsvaart canal and two side channels had to be constructed. During one year 800 workers had been digging every day. And where people spent their days, other developments followed, such as dwellings, places for storage, hostels and businesses. Although the economic success of cutting peat was short-lived (it even led to Passchier Bolleman's financial ruin), it spurred on to the foundation of Drachten. The Drachtstervaart brought in ships and the ships brought in not only return freight, but also their own service industry: rope-yards, carpenter's yards and forges. In 1746 the first real shipyard was established on the Langewijk, initially only for the construction of timber flatboats, but after 1895 also for iron hull ships. In 1902 a second shipyard followed on the Drachtstervaart. Along the side of the canal, pubs, shops, shipbuilding facilities, and public utilities, such as a rope-walk, were built. Around 1830, a town hall was built, and a notary public moved from nearby Oudega to Drachten. The peat industry of Drachten lasted for 200 years. When it ended, the poorer workers stayed behind; some became small farmers, but most of them had no success. 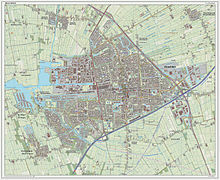 In the post-war period between 1950 and 1991, Drachten grew by an average of 1,000 inhabitants a year. The arrival of the Philips company was a major contributor to this growth. Today there are approximately 45,000 people living in Drachten; its major industrial production includes electrical goods, transport equipment, machinery, food, chemicals and furniture. 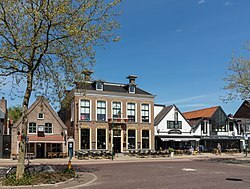 Drachten is situated in the municipality of Smallingerland in the east of the province of Friesland in the north of the Netherlands. Leeuwarden is 35 kilometres (22 mi) to the northwest, Groningen 45 kilometres (28 mi) northeast, and Heerenveen 24 kilometres (15 mi) southwest. It is located along the Wijde Ee waterway, which flows into the larger Prinses Margriet Kanaal. It is surrounded by many small towns; its environment consists of lowlands with forests and peat moors, and nearby lakes. In April 2007, artist Henk Hofstra painted a road in Drachten blue with white lettering and traffic markings. The road is called Moleneind. The lettering spells "Water is Leven" (Water is Life), meant to symbolize a prior waterway that was paved over. The part of this water that was situated in the centre of Drachten, was closed in the sixties of the last century, in order to stimulate the local economy and give space to the increased road traffic. Now the centre of the town was no longer reachable by boat. In 1996 the first plans were made to recreate the water way into the heart of the town so water tourists will come back to Drachten and visit the centre by boat; it is called the "Drachtstervaart" project. The reconstruction of the area started in 2001 and was supposed to last until 2011. Due to the economical crisis, the construction has been stopped for about two years. The construction on the water way continued in 2013, and it has since been completed. Drachten is not connected by the Dutch railway system but it is along the important A7 Motorway. Its extensive bus system connects it to Leeuwarden, Groningen, Heerenveen, and other centres. 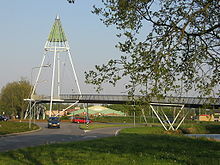 Drachten received international attention for a traffic experiment known as shared space, a concept pioneered by Hans Monderman. Almost all traffic lights and signs have been removed in the town's centre in an effort to improve traffic safety, based on the theory that drivers pay more attention to their surroundings when they cannot rely on strict traffic rules. Previously the town's centre had an average of 8 accidents per year. In the first two years after the system was introduced, yearly accidents were reduced to 1. The German town of Bohmte adopted a similar scheme in September 2007. ^ "Drachten". Britannica. 2007-09-11. Retrieved 2013-12-23. ^ The Laweiplein, Evaluation of the reconstruction into a square with roundabout (PDF) (Report). Noordelijke Hogeschool Leeuwarden NHL. January 2007. Retrieved 5 September 2012. ^ Catherine Bosley (2007-09-11). "Town ditches traffic lights to cut accidents". Reuters. Retrieved 2007-09-14. 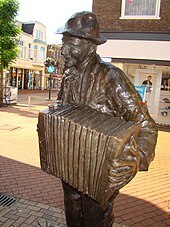 Wikivoyage has a travel guide for Drachten. Wikimedia Commons has media related to Drachten.